VSA Ohio (VSAO) is the state organization on arts and disability whose mission is to make the arts and arts education more accessible and inclusive for people with any disability and their support networks. 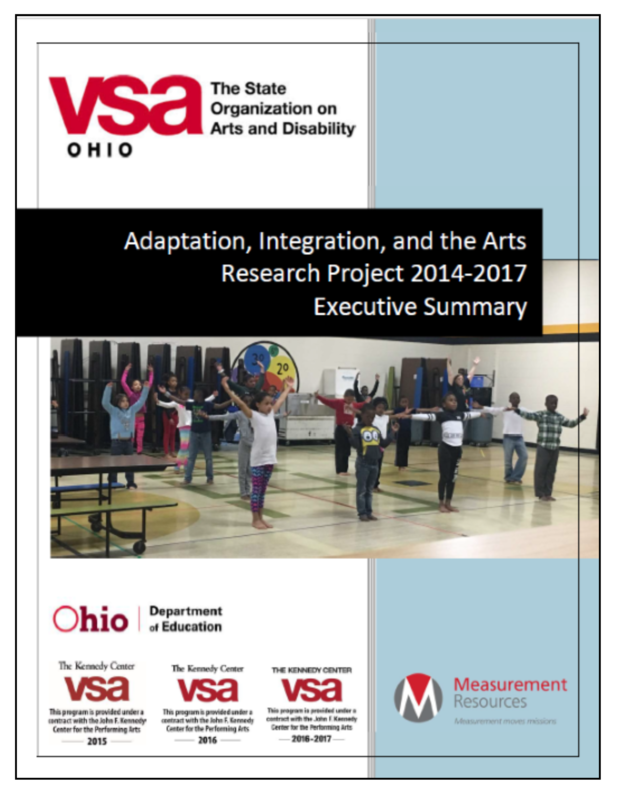 VSAO retained Measurement Resources Company (MRC) to examine the impact of its Adaption, Integration, and the Arts (AIA) program. AIA partners teaching artists and educators in inclusive classrooms to enhance teaching and learning through an arts-integrated residency and curriculum. Collecting both quantitative and qualitative evaluation and impact data over three academic years, MRC assessed the attitudes and experiences of participating teachers, teaching artists, administrators, and students, and the impacts the AIA program has on educational opportunities, quality of experiences, individual growth, and community connections. A total of 4,336 students, 38% of whom have disabilities, participated in the program between 2014 and 2017. Teachers observed an increased in cognitive, personal and social skills in the students. From showing pride in their work to independent problem-solving and expression of ideas, teachers reported not only advancement in these areas, but also indicated the translational application of these skills to 21st Century learning skills. While data was limited, it suggested that students experienced an accelerated rate of growth—an 18 % improvement—in reading fluency per week, compared to growth prior to participation in the AIA program. This research provided evidence that reinforced the critical role of VSAO’s AIA program in facilitating the development of a variety of skills in children with a wide range of abilities. And as a result of this independent assessment, VSAO can now more effectively communicate how students with and without disabilities experience significant growth and engagement as a result of these residencies. But perhaps even more important than affirming the effectiveness of the AIA program, MRC identified the specific elements that make the program successful. Among these key indicators, ongoing communication, active involvement of the teachers and aides, and ensuring that teaching artists had administrative support were all surfaced through this research. Having this knowledge will allow VSAO to continuously increase the success of its AIA program, while also increasing the social impact of increased integration of the arts in teaching throughout Ohio, and enhanced learning for students of all abilities. Read the VSAO report, and contact Measurement Resources Company to explore how your organization can identify, evaluate and communicate its impact to community stakeholders, donors and funders.